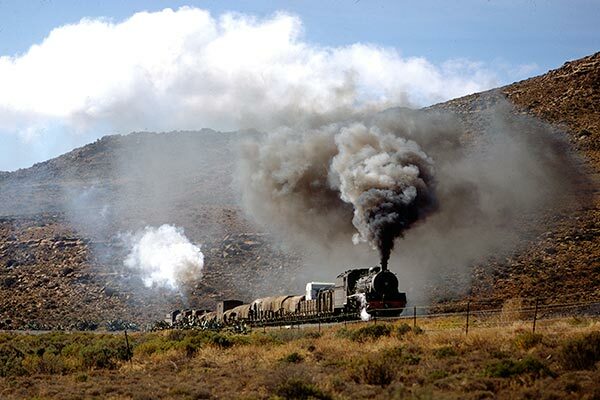 Caption - South African Railways (SAR) 19B class 4-8-2 1405 leads a goods train on Lootsberg Pass banked by classmate 1404 in September 1972. The 14 class 19Bs were built by Berliner Maschinenbau in 1930 and were a development of the 19 class. In their later years of service, the surviving members of the class were based at Graaff-Reinet from they worked across the Lootsberg Pass to Rosmead. Finally withdrawn in 1977, GMA class Garratts replaced them on the Lootsberg Pass.